Group posing with Louis Hascarl's horse and wagon, Brouse, 1918. 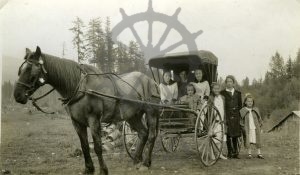 WAGON(l-r):Alice Leveque, Louis Hascarl, Della Leveque, Lily Hascarl (front, seated on Leveque's lap). GROUND:Annie Hascarl, Nellie Harvey, Ethel Hascarl. Leveque girls wearing coats made by Mrs. Crowell.